White Fillings offer our clients an alternative to traditional Mercury Amalgam fillings and a more affordable option to Ceramic Restorations. Many of our clients find that these White Fillings are aesthetically pleasing (as they are tooth colored) and this makes them a compelling choice to other restorations options. So with the decline in the use of amalgams by dentists, over 70% over the fillings created today are composed of resin or synthetic composite materials. Composite fillings are made up of acrylic and glass particles, and contain no mercury or other metals. The filling material is white or matched to the color of your teeth and has a very natural appearance. However, it should be noted that these types of fillings, while improving strength because they are fused or bonded to the tooth, are only a short-term solution for larger fills, with a life of around two years. What are the benefits of composite white fillings? Aesthetics are the main benefit, since dentists can blend shades to create a color nearly identical to that of the actual tooth. Composites White Fillings bond to the tooth to support the remaining tooth structure, which helps to prevent breakage and insulate the tooth from excessive temperature changes. 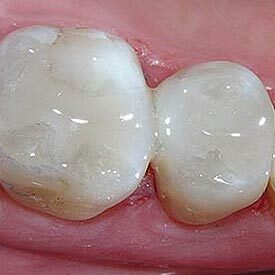 How long will a composite white filling last? Amalgam fillings expand over time. This leads to a weakening of the tooth structure, and can cause fractures. Composite fillings, however, support the tooth structure and thereby strengthen the tooth. Composite fillings are not only cosmetically far superior, but, as mentioned above, their “wear rate” is the same as amalgam fillings. Call Cornerstone Dental at (403) 995-1800 to request your White Fillings appointment today.